Rickie Fowler not impressed as his effort runs away wide to the right which leaves Kaymer and Bjorn two up. It's just not quite happening for McIlroy on the green today, so many of his mid to long range efforts are coming close but not in. Mickelson ensures the hole can only be halved which Garcia duly does. Still USA one up, now six holes to play. Potential problem in match 2 as Bjorn finds the bunker on 15 and Kaymer fails to make the green. It's a halved 13th between Gallacher/Poulter and Spieth/Reed. The Americans are five up with five to play. Who would your pairings be in the foursomes then? Post your thoughts here by hitting 'comment' at the top of the screen. Keegan Bradley plays one off the concrete but doesn't quite land it on the green. Jordan Spieth & Patrick Reed 5&4 Stephen Gallacher & Ian Poulter. Poulter misses again to send the game on and USA are level. McIlroy/Garcia v Mickelson/Bradley - Bradley misses the putt and Mickelson can't land the chip and Europe pull it back with three holes to play. Jordan Spieth - We convinced the captain we were a great best ball team. The genius of Ryder Cup captains. Pairing Spieth and Reed = genius. Picking Webb Simpson = not genius. Result = ordinary. Jimmy Walker is struggling on the green and hasn't made a putt all day. But after chipping in for an eagle earlier, he's now landed a bunker shot and pulled it back to just one again. Neither Fowler nor Walker can make the green on hole 17. Opportunity for Bjorn or Kaymer to take the initiative and seal the match. And there it is. Bjorn comes up short but, after the crowd have to be told twice to put cameras away, Kaymer pings one nicely onto the green and he should have a chance to close out the match. Great putt from Bradley but Garcia responds in kind and it remains locked. Will anybody find a way through in the last four holes? Walker can't chip in, Fowler slides agonisingly wide and it's Kaymer's chance to win it. But he misses and we are heading to the final hole. Europe will get at least a half point but will want the whole one having led this match all the way through. This Ryder cup is playing havoc with my working from home !!!! Foursome pairings just being announced. Perhaps a surprise that the rookies Jordan Spieth and Patrick Reed don't get another go this afternoon. They looked solid this morning. Wonderful shot by Sergio Garcia just after Phil Mickelson struggles with his approach effort. Bradley in the rough. 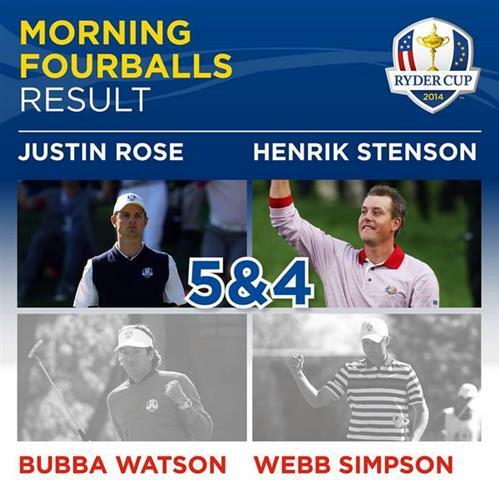 Speith and Reed not being in purely to avoid Ryder Cup Rookie burnout after they tore the course up this morning against a lacklustre pairing of Gallacher & Poulter, only a good thing for europe really because if they carried on like this morning europe might of been in trouble again. Yeah quite possibly. Would've been nice to see how they played if they were challenged by a stronger pairing though. Nearly a brilliant birdie putt from the edge of the green by Mickelson but it rolls around the lip and stays out. McIlroy & Garcia v Mickelson & Bradley. Huge! Garcia misses birdie to win the hole and it seems inevitable Mickelson will halve it. But the ball does not drop and with three holes remaining, Europe lead by one. Poulter on what went wrong with Gallacher: “We don’t hole enough putts, that simple. Clearly you have to hole putts - we didn’t do that." Kaymer & Bjorn v Walker & Fowler - Kaymer misses the chance for the win allowing Walker in for his first putt of the day and USA escape with a share of the spoils in match two. Big blow for Europe. bjorn and kaymer threw that away. Thomas Bjorn - There's a sense of disappointment obviously when you are two up with three to play. Thomas Bjorn - It was a pretty even match and we've just got to take it on the chin. 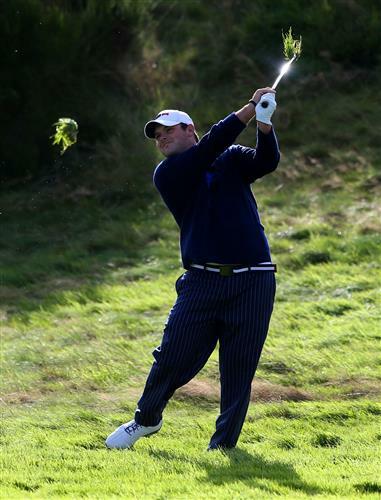 Just when you need it, Keegan Bradley digs out a delightful approach shot. Pressure on Europe to respond and maintain their lead. Keegan Bradley follows up that brilliant approach by nailing the eagle and it's all square again. Which way will this one go? Great job Tom, really enjoyed reading your updates. Thanks Lindsay, very kind. Hope you'll be sticking around for the afternoon!